Why should your social media be humanised? There’s approximately 2 billion internet users on social media at present, and with this, organic reach has now become the proverbial, ‘needle in a haystack’. Due to this, more and more brands are starting to engage in paid social media activity. At Bravr, our Social Media Experts say that there’s still a lot more you can do before turning to paid activity. While paid activity does help posts reach beyond followers and to a targeted audience; what about the audience your brand already has? If your brand has a number of followers that aren’t engaging with your content, a big part of this may be that your social media needs to be a little more human. So, you’re probably now wondering what we mean by, ‘a little more human’, and how this alone can make a big difference to engagement levels. If you’re using social media to reach out to your consumers, you’ll need to talk to them like humans, especially if you’re hoping to get engagement out of it. Managing social media on behalf of a brand is exciting, yet it’s not as easy as some may think. The content you put out on behalf of your brand is incredibly important. These messages give consumers an initial understanding about your brand’s personality and also, the personality of the people behind the brand. Engaging with your audience helps to harvest relationships and build trust in your brand. This is one of the first aspects your audience will notice. If your social media posts have a consistent style and a personable tone of voice, it will encourage users to engage with you. Remember, you’re not a robot and neither are your followers. We all have our own unique tone of voice, and brands should too. Make sure to convey this in your social media messages. This is a hard one for most brands. We get it – it’s easy to keep pushing out information about your own products and/or services. But beware, this will on most occasions, result in unfollows! It works just the same as when having a conversation with somebody. Nobody wants to listen to someone that always talks about themselves; so treat your social media profiles in the same way. Try to post a variety of content, and even share what your followers may tag you in or post about you. Be more human with your social media messages, and you’ll be sure to retain your followers and increase engagement levels. You could simply respond to your followers as and when they engage with your posts, or have a query. But this isn’t going to boost your engagement levels. Using social media listening tools such as Hootsuite, Tweetdeck, Sprout Social and Google Alerts, ensures that you’re able to detect when a user talks about your brand on social media. If you’re listening to your followers and engaging with them, your social profiles won’t just be perceived as ‘more human’, they’ll also attract more followers. Whether you’re responding to a comment on a post, a query, or a post you’ve picked up using social media listening tools (as discussed above), you now need to make sure you respond like a human. Generic replies that appear automated are not very sociable, and they’ll result in little to no engagement. So, why is it so important to have engagement? Your audience needs to know who you are and what you stand for; engagement on your brand’s social profiles will help strengthen relationships and build trust in your brand. Just like humans, we all have our own unique humour. Social media enables brands to convey their personality. Although, it’s important to remember that different brands will have different scales of humour, and for some brands, this is not always necessary. We’ve seen some great examples of brands using wit in their posts when engaging with customers/followers. A recent example of this is with Reebok’s Twitter profile. 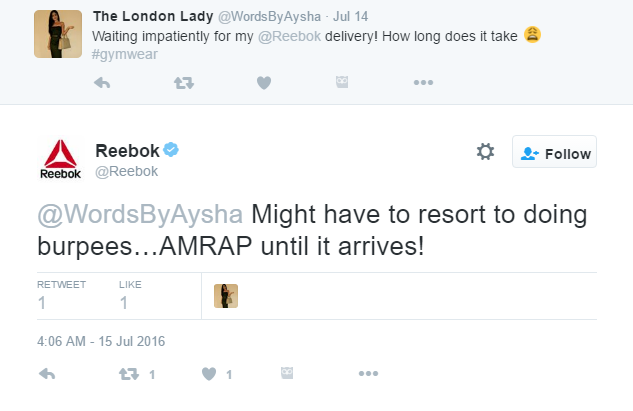 A member from Bravr was (impatiently) waiting for her Reebok delivery and tweeted them. What Reebok did so well here, was turn what could be perceived as a negative tweet about a delayed delivery, into a bit of humour. Adding wittiness to your messages will help boost engagement levels, but will also build and strengthen relationships with your followers. Mistakes happen; we all know that. But it’s important to own up to these mistakes. If you’re transparent with your followers, it generates trust in your brand. Social media enables brands to gain trust, and openly acknowledging mistakes will aid that. 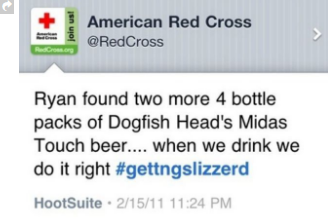 Here’s a great example of a social media mistake by American Red Cross, of which the PR crisis was handled in a witty, yet clever way. On the whole, your content needs to evoke emotion, be interesting and be human! Though this may seem easy, it’s also important to ensure your social media messages adhere to your company guidelines. At Bravr, our team of experts have years of experience writing content and managing social media platforms for a variety of clients, ranging from start-ups to PLC’s. If you’re looking for guidance on managing your brand’s social media and/or how to increase engagement levels, speak to one of the Social Media Experts at Bravr today.